Non-stick coated “Teflon” pans make me nervous. We are told to throw them away if the surface becomes scratched to avoid getting the non-stick substance in our food (this seems wasteful to me). Toxins may be leached out of non-stick surfaces into our food and into the air whether they are scratched or not. That is part of the reason I do not use Teflon non-stick frying pans. There is an interesting history of Teflon, etc. at http://en.wikipedia.org/wiki/Polytetrafluoroethylene. The other reason is that if you have a quality frying pan that is well seasoned not only will you have a naturally non-sticking pan, but you will either keep it your whole life or it can be recycled. The oldest non-stick frying pan (without teflon) would be the cast iron pan. Cast iron was so valuable and durable historically in the kitchen that old time homemakers often passed them on to their children. Cast iron pans have excellent heat retention, can add iron to your food (great if you are anemic) and when well seasoned are non-stick. 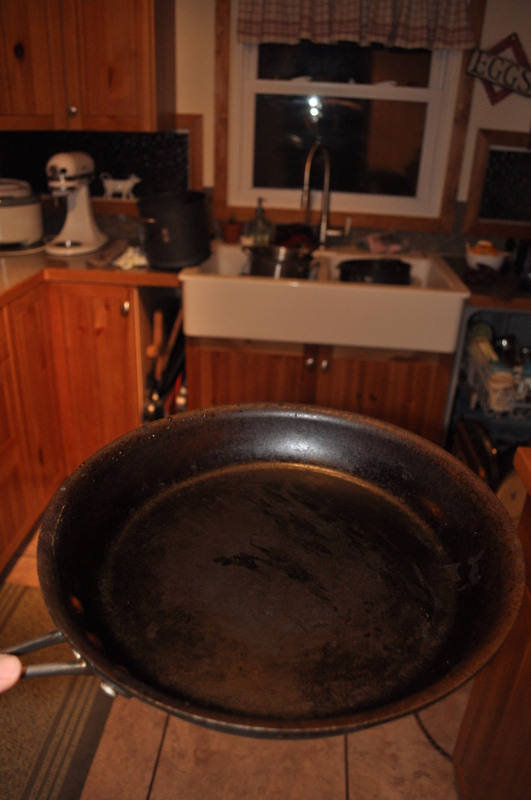 Though I have some cast iron I primarily use Calphalon frying pans in my home. My pans are about 9 years old. I am unsure whether they are the same as what is on the market today, and I am not advertising Calphalon necessarily. What I enjoy about my pans is that they are receptive to seasoning. Take note: that if you do burn something in your seasoned pan, you will have to scrub it thoroughly and then reseason. Lastly, how you cook in your pan also determines how well your seasoned pans work. Overheating or burning something in your pan will cause problems on the slickest surface. When cooking protein’s like fish, meat or eggs it is best to heat your pan first, add a little cooking fat like olive oil or coconut oil and make sure that it is hot, usually on a medium heat before adding eggs or meat. Cold dry pans cause sticking. In other words, you’re best friend in keeping your pans in prime condition and your food at it’s yummiest is patience. Thanks for reading MansWhirld! Love cast Iron for power outages too, which we have a lot where we live. I use them right on the wood stove.